This construction video tutorial shows the step-by-step process for creating the design of a sedimentation tank having rectangular shape. 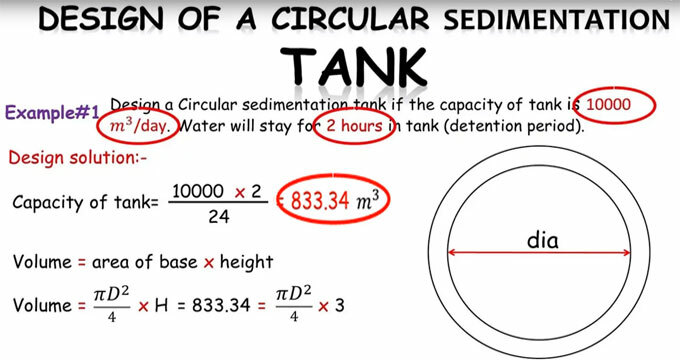 Problem: Create the design of a circular sedimentation tank based on the capacity of 10000 𝑚^3/day. Water will remain for 2 hours in tank (detention period). Here, design means to determine the diameter and the depth of the height of the tank. The capacity of the tank should be determined in volume. The capacity is 10000 cubic meter per day and 1 day is equal to 24 hours. So, just divide 10000 by 24 and multiply with 2 i.e. To get more information, go through the following video.